If you had a magic wand to make Annan High Street better, what would you do? That’s what Dumfries and Galloway Council will be asking folk in Annan over the next couple of months. The aim is to develop a plan of action to refresh the High Street and make it better for businesses and the community. A team of designers and planners has been busy working behind the scenes for the last few weeks, speaking to businesses along the High Street and pupils in local schools to find out what they want. Needless to say, parking comes up as a big issue for many businesses – as in every town. More events and festivals, especially in the winter. Owners should fix empty derelict buildings on the High Street. Better parking enforcement and signs to parking off the High Street. More space for pedestrians and especially better access for disabled people. On Saturday 14th April, the design team will be in the Market Hall from 10am to 2:30pm to present some initial ideas based on what they’ve heard so far. Nothing will be cast in stone! The idea is to stimulate ideas from the good citizens of Annan about how they think the High Street should be improved. Then the design team will work up the suggestions in more detail before another event in June, to check that they’re going in the right direction. Final costed proposals will then be drawn up so the Council can start looking for money and develop a plan of action. Big projects like this take time, so don’t expect change to happen until at least next year. But this is a golden opportunity to influence what our High Street should be like in the future. 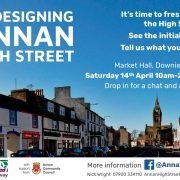 Drop in to the Market Hall on Downie’s Wynd any time between 10am and 2:30pm on Saturday 14th April to find out more and influence the future. Members of the Community Council will be there too to hear any thoughts you have for the wider town. See you there for a cuppa and a chat! Maintained by The Royal Burgh of Annan Community Council and copyright © Annan Online, 2017. All Rights Reserved.